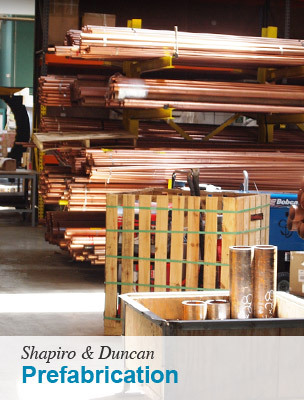 Shapiro & Duncan’s fabrication shop, conveniently located in Landover, Maryland, has over 51,000 square feet outfitted with state-of-the-art workstations and hoisting equipment for cutting, welding and joining all types and sizes of pipe. 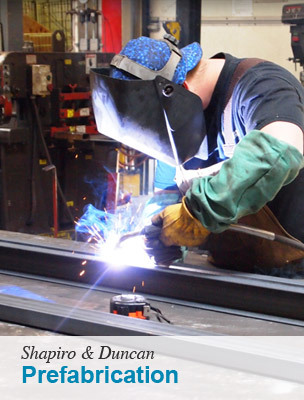 With its state of the art equipment and staff of qualified employees, our fabrication shop is able to fabricate and assemble accurately any type of piping configuration from the simplest riser to complex mechanical and boiler rooms. The shop’s controlled environment enables us to maintain a high degree of quality and a constant level of productivity regardless of weather or project site conditions. Prior to any fabrication, we process coordinated drawings using CAD Pipe software to produce the necessary detail making certain that all prefabricated items will properly fit within the mechanical design. All drawings are then reviewed and approved on the job site. Once fabrication begins, communication continues between our shop, CAD operators and job site. 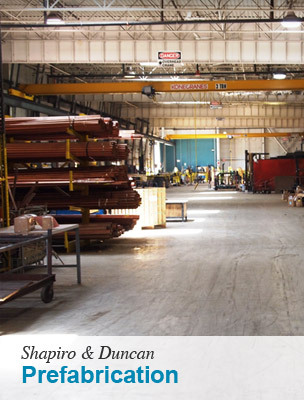 With eight acres of outside storage capacity, training/office space and parking, our fabrication shop has all the capabilities needed to successfully complete projects that require a large numbers of assemblies, intense time constraints, complex welding needs and custom fabrication requirements. 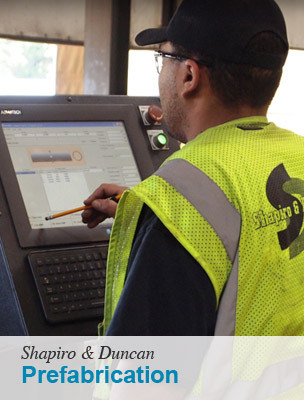 Our fabrication shop is a one of the reasons Shapiro & Duncan remains in the forefront of our industry.